Grenoble, known as the “Capital of the Alps”, lies in southeastern France, at the foot of the French Alps. Located in the Rhône-Alpes region, Grenoble is the capital of the department of Isère. Grenoble was well known in the 18th and 19th centuries for its glove industry. Because of its location near the Alps, hydropower industry participated to its development in the late 19th to early 20th centuries. Grenoble hosted the X Olympic Winter Games in 1968. The city is now a significant scientific centre in Europe, with an estimated 50 000 students. Grenoble is also well known as a large scientific center (nanotechnologies, computer science, physic) with more than 20 000 people related to research activities (11 800 academics and 7 500 in private research), 3 400 PhD students and interns, 450 patents per year, and 220 public research laboratories. The climate at end of March is ranging on average from a minimum of 4.4°C to a maximum of 15.3°C (Meteo France). At the period of time planned for ECIR 2018, several ski resorts in a 1h30 range are still open. 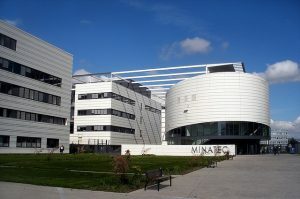 The conference will be held in Minatec, located near the city centre of Grenoble. Minatec is accesible with the Tram b.
Grenoble can be easily accessed by car, train or plane, as detailed below. Lyon St Exupery airport is only 55 minutes away from Grenoble city centre. With 33 regular national daily flights, this is the second airport after Paris (http://www.lyon.aeroport.fr). Shuttles between Lyon airport and Grenoble station run every 30-60 minutes for 40€ return (http://www.faurevercors.fr). Grenoble/St Geoirs airport is only 30 minutes away by car and 45 minutes by shuttle bus (http://www.grenoble-airport.com/). Geneva/Cointrin airport is a 2-hour drive from Grenoble. It has an extensive network of 142 direct destinations, 23 of which are intercontinental. Five direct shuttle transfers operate daily from the Grenoble coach station (http://www.gva.ch/fr-info@gva). Grenoble provides a large variety of hotels located in Grenoble city-center and closer to the conference location (10 min. tram / 15 min. walk from MINATEC). More than 7 hotels in the city center with a price ranging from 70 to 110 euros, more than 7 hotels in the city with a price ranging from 110 to 200 euros. Two low-cost hotels (“Formule 1” around 30 euros per night for 3 persons, and “Première Classe” at 31 euros per night for 3 persons) are located on the campus and provide access to MINATEC by tram. The University entity CROUS proposes student housing (Résidence Galilée, in the center of Grenoble, 300m from the tram line to MINATEC) for 43,50 euros/night per person. For security reasons, bags must be checked at the entrance of Minatec. This means that entrance on the site might be slightly longer, please take this into account when planning your journey.